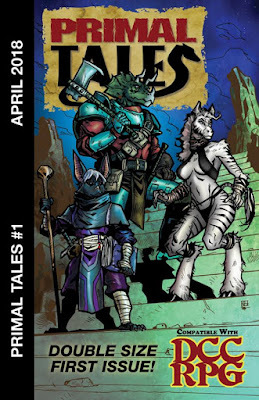 Primal Tales #1 was written by Brendan LaSalle and Brett Brooks. Art is by Dean Kotz (including cover), Jarrod Alberich (cover), Guoh, Amber Harris, and Bradley McDevitt. The publisher is Pandahead Publishing. 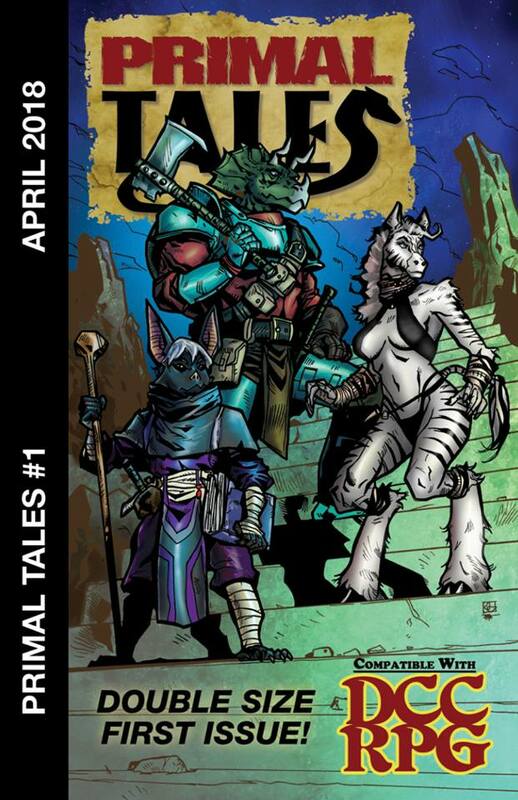 Primal Tales is a zine supplying options for adding anthropomorphic animal characters to Dungeon Crawl Classics or Mutant Crawl Classics games. Anthropomorphic animals have a long history in both children's and fantasy literature. Whether looking at Babar the Elephant, Reepicheep from Narnia, or Rocket Raccoon, these beings have been with us for a very long time. They have, of course, dominated a certain type of animation, as well as creating a sub-genre of mostly Young Adult fantasy with the Redwall Abbey series, MouseGuard, and similar works. And, of course, there are always Alan Moore's disturbing creations in the second volume of The League of Extraordinary Gentlemen. At first glance, Appendix N would appear to be bereft of such characters, but looking closer, one can see anthropomorphic animals in The Maker of Universes, by Philip José Farmer, and there are certainly anthropomorphic tigers in Lin Carter's World's End Series. If one delves into the various alien races met in the works of some of the listed authors, I feel certain that you will encounter more than one being that could be considered a primal. Even previous Dungeon Crawl Classics products have included creatures that might be considered primals, be they simians from Drongo: Ruins of the Witch Kingdoms, faerie animals from Creeping Beauties of the Wood, avarians from Hubris: A World of Visceral Adventure, or manimals from Mutant Crawl Classics. Still, you might be asking "Is this for me? ", and I am going to be providing some suggestions for using this material even if you are not going to have primal PCs. Introduction: What it says on the tin. Brett Brooks describes how Primal Tales came about: "That’s easy: someone asked us. Honestly, we were approached by a DCC fan, who asked if there was any chance of such a book existing. After some consideration, and several conversations with Joseph Goodman and the blessing of Goodman Games, the result is the book you hold in your hands." The World of Primals: This is a single page, describing the basic assumptions of the world of Primal Tales, and acknowledging that these assumptions may be different in your campaign world. Character Creation: Rules for creating primal characters. There is a "Primal Family Chart" that uses a d100 to generate over 80 different types of anthropomorphic animal, from "Alligator/Crocodile" to "Zebra". Each of these includes a natural weapon and special traits. There is also a "Primal Occupation Table". If not using primals in your milieu, the family chart may be used to generate interesting beastmen or humanoids, at the very least. Vulturemen, shark-like orcs, and kobolds with frog traits are all possible, and all grist for the mill. Savage Warrior: This is the primal version of the warrior class, which is given special abilities when using their natural weapons. If you are not using primals, this class is unlikely to be used...although you could use it as a template for beefing up some of the enemy humanoids and beastmen the PCs might encounter. Another possibility is that the class might be used to represent a Tarzan or Mowgli-like character, who starts with natural attack damage of 1d3. In this case, the character might be given the Special Traits of the animal type that raise him, if it makes sense within the game. For instance, Tarzan might have "+1d skill checks (anything strength related), +2d climb checks" (using gorilla traits as a model), and Mowgli "Heightened Senses (+2d scent), +1d Skill Checks (Tracking)". of magic itself given form, and are invisible to most. To those who know their secrets and are willing to pay the price, an arcane spirit is a gateway to magical power." This class comes with a new 1st level spell, find spirit familiar. In a game using primals, it makes sense to limit this class to primal characters. "Race as class" is used, after all, to keep elves from feeling like humans with superpowers and pointy ears, as they are in some other role-playing games. It also helps to keep the flavor of various options from merging. In a game without primals, there is no reason not to open this class up to either humans and/or elves. Or, hell, perhaps in your world this sort of communion is a "halflings-only" thing! Chimerae: Spellcasters who can take the forms of various animals, this would be a pretty cool class to include in your game milieu whether it is limited to primals or not. The class includes some animal trait information (useful when creating statblocks for natural creatures, or when modifying beastmen/humanoids, as noted above) and three new 1st level spells: consult nature, resist weather, and spirit healing. If you are not using primals in your game, you might just want to call this a "druid"! Even if you do not want PCs using this material, there is plenty here to crib from for NPC antagonists. Lamia: Patron of Mother’s Nightmares: "There are many conflicting stories about the life of Lamia and where she originated. Some say that she is the cast-off lover of a god, cursed by that god’s spouse. Others claim that her children were stolen by a jealous, barren goddess, who drove her to madness and down a path leading to atrocities that corrupted her and gave her great power. Then there are those who say that she is a succubus who escaped from the depths of hell, intending to find the perfect child to call her own. Physical descriptions of her vary widely. Sometimes Lamia is described as having the torso of a woman and the body of a lioness or a huge serpent. At other times, she is seen as a beautiful woman with the maw and fangs of a deformed beast." Lamia is given a full patron write-up. As a patron who combines human and animal natures, Lamia is appropriate to this work. There is nothing, however, that limits Lamia from being used in any campaign. For other versions of Lamia, see the Sanctum Secorum Episode #35 Companion: Hundra (1983) or D.A.M.N. Magazine #1 - Winter 2017. Lamurae: "From the nightmares of mothers and the essence of Lamia, the Lamurae were born. Ranging between one to three feet tall, the Lamurae resemble the shadows of death and decay." Lamian Succubus: "In the vast demonic realms, to have a name is a badge of honor. And in the annals of the succubi stories, no name is more revered than Lamia. Many of the succubi have devoted themselves to Lamia, seeing her as one of their own who has elevated them to newfound power and prominence. To that end, the Lamian Succubus is unlike any other." For other types of succubi, see The Balance Blade in The 13th Skull, The Crimson Void, and the Sanctum Secorum Episode #35 Companion: Hundra (1983). Avatar of Lamia: "The fact that no one can agree upon the origin or appearance of Lamia is not helped by the manifestations of her avatar. Those who have survived seeing her manifest have claimed that they have seen three different incarnations: The Maiden, The Beast, and The Demon. However, the true number of incarnations has yet to be accurately documented." Statistics for all three avatars mentioned are provided. These monsters are appropriate for use in any Dungeon Crawl Classics campaign, and are in no way dependent upon the use of primals. They exist everywhere. Among the common people they are talked about in quiet tones. Half man, half beast. Stories of them are told around campfires and hearths. Thanks for the overview! Nicely done! I recently picked this one up. Happy to have it as part of my DCC/MCC Gaming Library! Will definitely see use at my table.